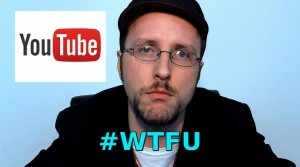 In a video posted last week week, famous YouTube sensation The Nostalgia Critic laid out the amazing case against the “big media” who are using YouTube to bully independent creators, regardless of their right to fair use. He titled the beautifully articulated argument “Where’s the Fair Use?” and created the now famous hashtag #WTFU. His argument brings to light many of the strange, and borderline abusive, devices used to take down videos that are clearly within the realms of fair use. Kyle K. Courtney (@KyleKCourtney): Before we get into the #WTFU controversy, please tell us a little bit about your work, and how fair use is a critical aspect of that work. [Channel Awesome]: We do a variety of shows that hinge on pop culture, but our most popular show is the Nostalgia Critic, a show that we have been doing for over eight years. The show revolves around reviewing movies, and with reviewing movies we show clips. The clips shown are either directly talked about as a voiceover during the clip’s presentation or after the clip has been shown. The discussion of the clips can direct criticism or commentary and in our newer videos these clips lead to a parody sketch. Fair use states that clips from movies and television can be used under the basis of commentary, criticism, education, and parody. Your #WTFU video has gone viral among many different communities beyond your typical YouTube movie fanbase, including (from our research) lawyers, librarians, think tanks, IP policy makers, artists, documentarian, and more! (It has had over 1 million views, 100 thousand “likes,” and 15 thousand comments). What was the moment, or “the straw that broke the camel’s back” that caused you to make this video? This has been something that we have dealt with for most of our existence. We originally had to leave YouTube back in 2008 due to the constant copyright claims on our 5 Second Movies and early Nostalgia Critic episodes. Back then you didn’t have the ability to fight it, and after three claims your channel was gone. We started our own website thatguywiththeglasses.com, now channelawesome.com) and used blip.tv to host our videos. We started bringing our content back to YouTube with the help of blip.tv in early 2013 on the League of Super Critics channel, and then we created our own channel in July of 2014. (achannelthatsawesome) We finally bit the bullet and started uploading our new Nostalgia Critic episodes in May of 2015 and started seeing what to expect on YouTube. Claims from people stealing public domain content and saying they owned it, false companies claiming content, and claims on dozens and dozens of Nostalgia Critic reviews. The videos that we recently made on the subject were something that we were planning to do for a while now, and with what has been happening on YouTube with people starting to really discuss it, it just seemed like the time was right. We were not getting any answers from YouTube or the people claiming our content, and the longer content creators stayed silent the more frequently this was going to happen. We have talked about it before though. On the Tommy Wiseau Show, filmed during our The Room, How 5 Second Movies Work, and Leave 5 Second Movies Alone, both related to our initial exodus from YouTube.) Heck, we flew 10 people out to DC during the SOPA/PIPA fiasco and met with Representatives and staffers, informing them how those two laws would affect our small business. You mention a few uses of the copyright takedown system being used for ulterior motives, outside of the protection from copyright infringement. One is the use of takedowns to suppress, scare, or censor opinion, speech, or viewpoint. Can you tell us more about that and its potential effect on all web-based content producers? Aren’t there repercussions for fake takedown abuses like this? The example provided by Jim Sterling is a perfect example on how companies can use the DMCA system to take down negative reviews; honestly, he sums this up perfectly. As far as we know, there are no repercussions for false claims and takedowns, as these companies continue to do so, even after releasing manual claims and letting DMCA takedowns expire. In your experience, which YouTube claims are more dangerous: the claims made through the rightholder’s automated algorithm or manual claims, which means a human being actually viewed and decided that their claim was valid? The takedowns done through DMCA are of course the most dangerous, at least on a creator’s account. YouTube automatically issues a strike after a DMCA claim is processed. Generally one strike on an account limits you to videos that are 15 minutes or less, but the most infuriating thing about what one strike does to an account is the fact that you can’t appeal any more claims while the strike is active. You can fight it and win (this can take 10 business days), but if you let it sit then that penalty would last for 6 months. On the other side, Content ID claims are just as bad in some cases. Through the automated system, using as little as 15 seconds of a piece of work can cause the Content ID system to place up to four different infractions on the video. 1) Tracking: they can track our videos stats (I have never seen this used). 2) Monetization is disabled: no one can make money off the video. 3) Monetization is taken: the claimant takes the money the video makes until the content owner files a counterclaim, and then no money is made on the video until the claim is resolved (this can take up to 3 months). 4) Blocked videos: this one most people aren’t talking about but I believe it’s the worst one. The claimant is basically getting the effect of a DMCA takedown without issuing one. A DMCA takedown requires YouTube to take the video down (no one can see it); a global block does the exact same thing. No one can see the video. Global blocks can be placed automatically after “infringing” content is found by the Content ID system without a human looking at. Companies are getting a DMCA takedown without the legal process of one! 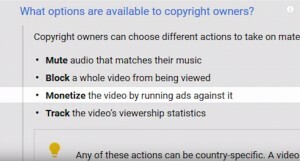 I think one of the most shocking aspects of the video was the section where you cover the options for the takedown claimant, which includes, without proof of an actual, legitimate takedown, the fact that the claimant can take your monetization of a video (for those that are not YouTube savvy, this means engorging any profits made by the video producer) until you file a counterclaim, and even potentially keep that money. Can you talk about when this happened to your program? Could you recover that money at a ll? This happens all the time. I believe we currently have nine videos being monetized by the claimant, and currently are fighting two of them. The system allows only three counterclaims to be open at a time on a YouTube account, well at least on the creator’s end. Filing three at once potentially could result in a channel deletion if all three come back with takedowns, plus what if we have a new video that gets claimed right out of the gate. We’d want to fight that right away. Our Event Horizon review was claimed a day after it went up on YouTube, and I guess luckily for us the claim was released in 2 days. We can’t recover the money. The period for when the video is claimed by the claimant and then countered by us results in the claimant keeping the money. After a counterclaim is in place, YouTube will not put ads on the video until the claim is settled. This results in lost money for the YouTube content creator if they win their case. You talk about an uptick in the amount of takedowns issued over the last year. What do you think is driving this move? Honestly, we have theories, but really at this point they are just that. These programs create “safe harbors,” why do you think legitimate content makers, like yourself, are being lumped in with pirates who are actually infringing? Intentionally? No. Unintentionally? Yes. The system currently in place is and has been abused for a while, and over time claimants have realized that they can claim anything and everything and not have a single repercussion. One of our friends, Brad Jones, had a video that had zero copyrighted footage in it claimed. That video was just he and a friend talking in a car about a movie they just saw. Another YouTuber, Chibi Reviews, had DMCA takedowns done on his account just because he used a thumbnail with a copyrighted image on it; nothing else in the video had anything remotely copyrighted. They’re just taking advantage of the system, because it allows them to. The #WTFU video notes that you have changed your production in order to try to avoid getting these takedowns (not using clips, re-enacting scenes, etc.). Has this helped at all in lowering the amount of takedowns you have received? And, from a creator’s perspective, how frustrating is it that you have to change the way you make your show and, in fact, alter your creative output because of fear of legal action? Over the past 3 years we have been inserting sketches into content, shortening the clips used, muting any audio from the movie that we aren’t directly talking to or critiquing, and recently we started doing reviews with just reenactments and no footage. These are done on titles that we know will get claimed instantly. Having a new Nostalgia Critic episode claimed takes away a large chunk of money from us, and doing clip-less reviews is the only way to make sure we’re safe, but, as stated in above, even that might not be true going forward. Frustrating? Last year a new claim was a weekly occurrence while this year we’re dealing with claims almost every other day now. It’s tough to get through the backlog of claims when A) you have a bunch of them (we’re currently sitting on 14), and B) you really can only fight two at a time and hope it takes less than 3 months. You recommend developing the same types of penalties in the system for copyright infringers as for those that make false claims. In your words, how would those “false claim penalties” work? For the false claim penalties, blatant repeat offenders need to have some sort of action placed on them. The tricky part is they all have some agreement with YouTube after the Viacom case, and with that said all these issues aren’t fully on YouTube’s end. YouTube will never get an OK from them to disable their claim process via Content ID because there are people who still upload full movies, television episodes, and music onto YouTube. So, penalties at least relating to Content ID would never happen. What could help this is adopting a universal percentage used on content through the video. Fifteen seconds should not be the beginning of this and 20 seconds shouldn’t be the standard that they use. The EFF proposed 90% of the original work be what is considered infringing. Heck, we’d be fine with 40% becoming the new bar. Then there are manual claims and DMCA takedowns. Manual claims mean that someone “viewed” the video and then claimed it as infringing. The DMCA has you state, under perjury, that you believe the video is infringing on your copyright. So, when these claimants check that little box about perjury, and then let the claim lapse after the counter DMCA is filed, shouldn’t perjury possible be brought to the table? Manual claims should be the same, as they are doing the same thing as a DMCA claim, by manually claiming that they saw the video and found it to be infringing. If the claimant issues a manual claim and releases the claim, or if the claimant issues a DMCA takedown and lets it lapse or releases the claim, then their ability to do so in the future for 6 months should be limited just as our accounts get limited by their actions. The Lenz case was viewed as a victory for fair use over these abusive takedown claims. Why do you think the situation has gotten worse, despite the Lenz’s holding that requires a fair use inquiry prior to issuing a takedown notice? Currently, we don’t see any change resulting from that ruling. On a side note, we have had videos of ours show on TV without asking our permission, and we’re fine with that. Most of the short videos used were shown under fair use. The people showing our videos edited them and then provided commentary or criticism on said video. Fair use is a two-way street. One party should not control both sides because currently the idea of a fair use defense only benefits them. In the end, this problem, while running rampant on YouTube, is caused by the very outdated copyright law that we currently have here. One of the more frustrating things to come from this is people telling us that this whole situation has them scared to continue doing their videos on YouTube, and then hearing others say that they’d love to start up a YouTube channel but the current system in place has them too frightened to even try.